Delphi Software is a a boutique provider of high-end R&D Engineering products and services enabling its partners to achieve the competitive edge in a global digital market. At Delphi, our relentless focus is on our client success and we pride ourselves on the ability to seamlessly extend our partner’s teams and to create and support truly innovative products that drive our clients’ revenue growth and improve bottom line. The constant challenges of accelerated time-to-market, improved product quality, maximized returns on R&D budgets and expansion into new markets continue to grow. Delphi Software expertise will support greater business agility, reducing costs and retaining the competitive advantage. Leveraging its 25 years of software development experience and highly professional tenured staff, Delphi is excited to provide software engineering services for enterprise digital transformation through innovation and leadership. Our services are backed by a strong expertise and extensive experience in different technologies and platforms, methodologies and processes that our partners require such as Cloud, Data Science & Analytics, Mixed Reality and many others. Adopting new age digital technologies and engineering models is essential for global R&D. Over 90% of our staff have attained advance engineering degrees and various technology specific certifications. Our team stability is above industry average due to job and educational opportunities we provide to our employees. We, at Delphi Software, build long term relationships with our partners who are global leaders in their respective areas such as speech and language technologies, interaction recording and analytics, Big Data, AR/VR solutions, Iot/Embedded, FinTech and others. We serve wide range of industries such as High Tech, Financial Services / Insurance, E-Commerce and others. The visitors of the Saturday meetup were smiling and at the same time concentrated. Thanks to our speaker Mykola Sedletsky and guests for a wonderful Saturday morning. We are waiting for new meetings! The Delphi Software IT Olympiad was held on March, 23 at the VNTU. Traditionally for this time the software IT Olympiad sponsored by Delphi Software was held at the VNTU on March, 23. Students of the 1st – 3rd years took part. The winners were awarded with the semiannual monthly scholarship: 1st place – 2,500 UAH, 2nd place – 2,000 UAH and 3rd place – 1,500 UAH. The participants who did the best solution in each category and participants hors concours received the 1,500 UAH award. We thank everyone for participation and congratulate the winners! 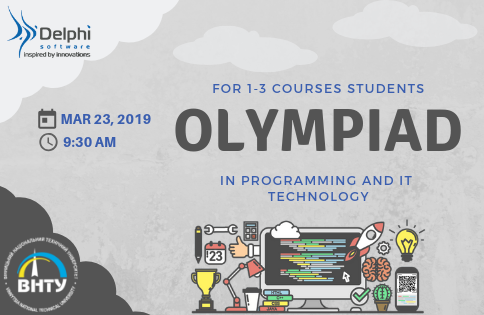 The Delphi Software IT Olympiad on March, 23 - participate and win the prize! Besides, there is one-off award of 1,500 UAH for each one of six categories for the best solution. The category Algorithms & data structures is mandatory for the participants. Two additional categories are to be chosen by the participants. Altogether there are three categories to be written. We wish good luck and excellent results to all the participants! 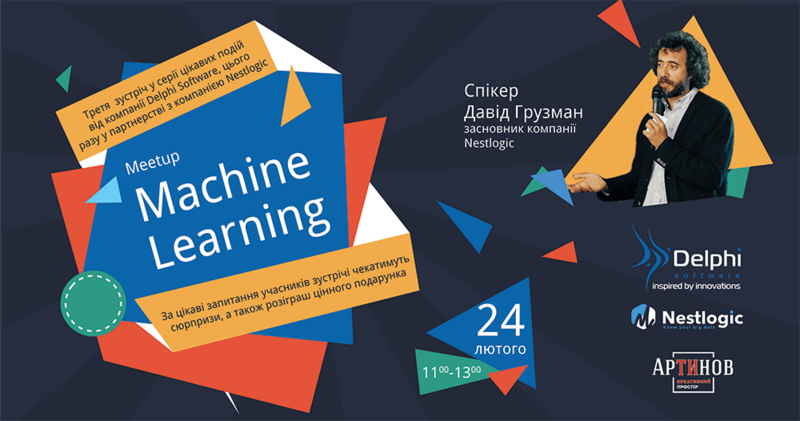 Brilliant news for those who missed the meeting dedicated to Machine Learning. There can be no doubt that we are very fond of our already traditional meetings at Artynov, especially for the opportunity to take part in discussions with the speakers. But so interactive learning and experience sharing as it was that Saturday we haven't handled before. Thanks to our speaker Vadym Hrusha, the founder of BlockSoftLab, for sharing his expertise, which is gained in the world of bitcoins, and for pleasant surprises for the guests. We look forward to the regulars and new participants at the next meeting, the announcement will be very soon! The software IT Olympiad sponsored by the Delphi Software was held at the VNTU on March, 24. Students of the 1st – 3rd years took part. The winners were awarded with the semiannual monthly scholarship: 1st place – 2,000 UAH, 2ndplace – 1,500 UAH and 3rd place – 1,000 UAH. The participants who did the best solution in each category received the 1,200 UAH award. Photos of the event here. Machine learning and artificial intelligence have been attracting more and more attention, and the scientists believe that among all modern innovations, these two cutting-edge technologies have the greatest potential to change our lives. Just Imagine that you hire someone who never gets sick, never has a rest, can simultaneously communicate with a few customers and even does it for free! It’s not a fairy-tale, it's a reality. We invite you to join the first in a series of interesting events from Delphi Software! 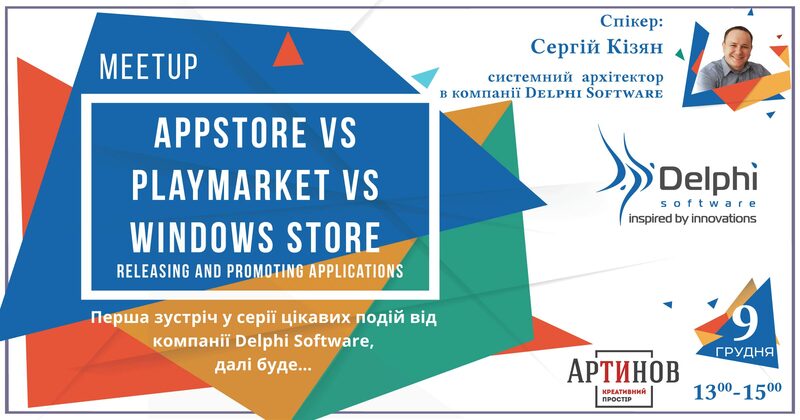 Sergey Kizyan, a System Architect at Delphi Software, shared his experience concerning the release and promotion of applications in 3 popular markets, answered the questions and awarded the most active participants of the event. Innovations in consumer electronics, conceptual technologies and IT are announced with the astonishing speed and frequency, the variety and number of new devices increase exponentially. Nothing can deter the progress, and the time when innovative devices, that stagger the imagination, become a part of our everyday life, is not far off. “Welcome to the real world”. A man wearing interesting goggles in a large white room said those exact words in the The Matrix movie and then he is offered the choice between a red pill and a blue pill. The character went with the red pill, taking him out of the ultimate virtual reality simulation into a post-apocalyptic world ruled by intelligent computers. Today, we’ll take the blue pill and see what virtual reality has to offer in our world of cool gadgets. In this article, we will look closer at several technologies, which change the way we perceive our reality, whether that involves entering a virtual world, augmenting an existing one in a realistic and interactive way, or somewhere in-between. Google, Facebook, Samsung, Microsoft and other technology companies have invested billions of dollars in developing Virtual Reality (VR) and/or Augmented/Mixed Reality (AR/MR). Now we’ll try to puzzle out what’s the difference between all of them, making some general statements and talking to our experts. Until recently, virtual reality had been something of a fantasy for storytellers and technologists. As long ago as 1935, American science fiction writer Stanley G Weinbaum described something like virtual reality in a short story called Pygmalion’s Spectacles. Since Ludwig’s magic spectacles found their way into print, there have been decades of experimentation around virtual reality, from the first head-mounted VR system in the late 1960s to the first commercial products in the 1980s. The current age of virtual reality began in 2010, when American teenager Palmer Luckey created the first prototype of a VR headset that would evolve into the Oculus Rift. Two years later, he launched a $250,000 Kickstarter crowdfunding campaign to commercialize it – and $2.4m of pledges later, the tech industry’s interest in VR was reborn. Two years after that, Facebook’s CEO, Mark Zuckerberg, liked the Rift so much he bought the company for $2bn. Several competitors have emerged since then, from the HTC Vive and Sony’s PlayStation VR to smartphone-powered headsets such as Samsung’s Gear VR and Google Cardboard. Meanwhile, hundreds of developers are making VR games and apps, film-makers are exploring the potential for documentaries and animation, and Facebook and YouTube have jumped on the bandwagon with 360-degree videos. The most important piece of a virtual reality kit is the headset, a device like a thick pair of goggles that goes over your eyes. The more expensive, higher quality headsets need to be connected to a computer to run apps and games, while some cheaper ones use a cellphone clipped to the front of the headset. All headsets need to be used alongside a good quality pair of headphones, and there are other optional accessories from hand controllers to treadmills that are all designed to enhance your simulated experience of being in another world. Hand controllers translate your real-world gestures into whatever game or application you’re using, although standard gaming joypads can also be used. UVR devices have their own app stores, similar to smartphone app stores, where you can browse and download games and apps. Some of these stores are accessed using the device itself, while others – the VR section of the Steam digital games store, for example – can be browsed on your computer. Augmented Rality does not change the human vision of the surrounding world and its perception, but only complements the real world with artificial elements and new information. Augmented reality allows users to obtain information not using hands and not distracting from the process. While virtual reality is about immersing you in an entirely virtual world, viewed through a screen in your headset, the real world outside you isn’t part of the experience. But augmented reality, as the name suggests, is about augmenting or adding to reality. You might be looking at your cat or up your street, but there could be digital characters and content overlaid on them. Glass, the hi-tech spectacles launched by Google in 2014, were an AR device, but the company has given up on trying to sell them as a mainstream idea. More hardware is on the way, however: Microsoft’s HoloLens is the augmented reality equivalent of PlayStation VR and with a similar emphasis on gaming; the popular Minecraft has been one of the key demos for it. HoloLens is essentially a holographic computer built into a headset that lets you see, hear, and interact with holograms within an environment such as a living room or an office space. Microsoft has built the headset without the need to be wirelessly connected to a PC, and has used high-definition lenses and spatial sound technology to create that immersive, interactive holographic experience. For now, the most affordable way to try augmented reality is through smartphone apps, which overlay text and graphics on the feed from the camera. The game Pokémon Go and the face-mangling lenses in Snapchat both use augmented reality. Others are more specific: the DFS Sofa and Room Planner (see how a new sofa might look in your living room), Plane Finder AR (see where that plane overhead is going by pointing your camera at it) and Mardles (make 3D characters jump out of stickers for kids). This Mixed or Hybrid Reality is now playing a real "star" role, as it "mixes" the augmented and virtual realities, expanding our ordinary world with artificial objects indistinguishable from the real ones. This technology is about creation of the most high-quality and realistic images that could not be distinguished from real ones. Augmented reality produces only some visual information, which is very different from your surroundings, while the mixed reality does its best to make the refrigerator standing on your windowsill look as realistic as possible. Mixed Reality technology brings the virtual images into our space-time, allows to visualize and fix their location by the real objects, so that the consumer perceives them as real. In a sense, this technology combines the best features of AR and VR. A user continues to interact with the real world, in which, at the same time, there are strikingly "natural" virtual objects. Thanks to development of different neurocomputer interfaces and Internet services human communications have already gone far from that described in science fiction. How should virtual reality devices evolve to stop being just a toy? How can they bring real benefits and move humanity forward? We can witness this process now. Every day we read new articles on attempts to use virtual reality in teaching, phobia therapy, corporate segment, medicine and industry. Developers are constantly looking for new ways. We barely have time to follow all of them. Virtual reality today is not a beautiful fantasy, but is a part of our life. What can it offer, apart from creating alternative worlds? We talked to Sasha Matviishen and Zhenya Vasilenko, who are engaged in VR/AR/MR development now. Our experts work at the Arvizio company projects. This company delivers advanced software solutions for augmented and mixed reality experiences utilizing the Microsoft HoloLens™ and other leading mixed reality devices. Its software platform brings new levels of efficiency with state of the art collaboration and 3D visualization techniques to serve a variety of industry verticals including healthcare, industrial, enterprise and education. The guys will share with us their insights about VR, AR and MR, telling us what is waiting for this sphere in future and whether it’s possible to influence our lives by means of these realities. Zhenya, how did you come to the AR/MR development? Zhenya Vasilenko: It was an offer from our managers and I couldn’t refuse. It was about cutting-edge technology, fast-growing market, new perspectives for the Company, challenging tasks… I simply had to try. What is different between the AR/MR development and the tasks you did before? Did you have to learn something? ZH: Professional development includes constant learning, so not much of a surprise here. The approaches remain the same: creating robust software with maximum efficiency. As for me, I was not familiar with UWP and Unity before, but I’m quickly filling the gaps. What are you doing in the AR/MR sphere now? Tell us about the projects and your achievements. ZH: Our software platform allows to display complicated and huge objects smoothly, which is especially useful in presentations. I’ve touched all C#-based aspects of the platform, both server and client sides. Currently I’m finalizing the custom framework, which supports sending events to the client based on long polling approach. Our prior investigation has found, that we can’t use existing solutions/frameworks to accommodate our needs in a safe and predictable manner. New projects. How do they look in your plans and dreams? What do you want to implement? Sasha Matviishen: I haven’t thought of new projects, but as for the current ones I would be happy if they are used by billions of users around the world (the dream of many programmers). ZH: I haven’t thought much on that as well. Currently my priority is to learn new stuff, and there is still much to do here. Will think of it later. What are the main technological difficulties when working at AR/MR projects? ZH: I’d say, the biggest challenge here is the overall “immaturity” of the technology. Everything is changing, evolving constantly. Running into bugs in frameworks/IDEs is not something exceptional. That is why we prefer to develop our own long polling implementation: we can’t guarantee that things that work fine in regular .NET, will work for UWP, even if the documentation states so. Besides, there are next to none “best practices” developed so far. On the other hand, this fact can be considered as an advantage: we’re developing best practices ourselves, which is exciting. What are the peculiarities or differences in developing VR and AR/MR applications? ZV: While VR substitutes reality, AR extends reality. From the user’s perspective, VR is good for simulation, and AR could bring more information to real world, including navigation etc. From the developer’s perspective, AR is more difficult, because it requires constant scanning of real world and adjusting to possible changes since the last scan, like people movements, table position shifting and so on. You’ve seen a lot of different AR/MR projects. Could you explain what should be done that AR/MR projects become more helpful to people? ZV: First of all, manufacturers should improve technologies to make them more user-friendly and “purse-friendly”. Looking at overall IT development, I have no doubts that this segment will evolve rapidly. Secondly, developers should create something useful, which is also an ongoing process, and we’re part of it. I’m sure you have some favorite VR/AR/MR applications. What project was the most exciting? ZV: Personally, I prefer AR, for example, RoboRaid. RoboScorpions, who roam the walls of your room, occasionally breaking through walls and throwing fireballs at you – it’s something you will never forget. And the narratives about dinosaurs could look really great. SM: I like Rome and Peru virtual tours. You watch a virtual gladiator battle and you, like the Roman emperor, can choose the battle final - to kill or to pardon. Is it profitable now to develop for AR/MR? What is the demand? ZV: It’s a very young and promising segment. Lots of companies started participating in this competition globally speaking. What is developed for AR/MR? Games, what else? What genres (other than games) are the most promising here? You used different VR/AR helmets. Which one is better, more advanced? ZV: I’ve started with MS HoloLens. I’ve also read many articles on the topic. Currently, it’s the most advanced device, and not only in Microsoft’s opinion. So, I don’t feel that I should try something else. When something new appears with additional capabilities, I’ll give it a try. Do you have a helmet at home? How do use it? ZV: I don’t have a personal VR device, I’m working with HoloLens, a company’s asset, using it for ongoing development. Do you think VR/AR will grow into a socially significant sphere? Will it become part of our lives, say, in 20-30 years? ZV: I’m sure, that it will definitely happen, and much sooner. For example, HoloLens is actually spectacles with an embedded computer. What can this device do? Everything, that the computer can! And much more, the things we haven’t even thought about. The first real step could be smartphones replacement. If you could wear spectacles that could not only protect you from the sun or improve your eyesight, but its embedded voice-controlled computer would allow you to make phone calls, display additional info on top of real-world objects – why would someone ever need a smartphone then? What is your forecast for the AR/MR market? What are the problems now? ZV: It will grow, and it will grow fast. Current problems are hardware-related. There are lots of challenges the manufacturers should address, and they’re doing a great job for it, including user experience: the devices are a bit more weighty than we’d like, the field of vision could be a bit wider, work time from a single charge could be a bit longer etc. Still, looking at PC evolution from several rooms of very expensive hardware to affordable portative devices, I foresee bright perspectives here. Does the AR/MR market influences the development of other applications (games)? ZV: Definitely. Games could take the biggest part of the pie, regardless of development in other directions. People will always pay for their entertainment. Not to mention, that you could create educational and maybe even presentation software in the game form, which extends this segment even more. Imagine that you are not limited by technologies. You have a perfect AR/MR simulator. Which application would you develop? SM: I would like to have a universal AR assistant with such functions: 1) navigator, which shows the itinerary with holographic arrows directly on the road; 2) highlighter and voice warnings of possible hazards, including criminals face recognition and recognition of dangerous items in hands; 3) providing information about people by face in the form of holographic text and voice (for example, Facebook public data), and about different things as in Terminator. ZV: Well… This program would allow to simulate our real life, plus the save-load possibility would be great. Now we’re learning through our own mistakes (some people claim, that they learn through other people’s mistakes – but it is rarely true, even if people don’t believe it is). Sometimes the cost of those mistakes is huge, and sometimes the actions could not be undone. Surely, it’s ok, such is life. But what if you could do some action, see its consequences and load previous save, if you don’t like the results? What if you had full-featured life simulator, which would predict your future, based on your current habits and their effects over the longer run? For instance, if you smoke for 15 years, please, see your health outcome. This is your lifetime. Load previous save, and this time do exercises for 15 years – observe difference for your health and life in general. Such simulation may provide us the same lessons, but much cheaper! If you realize in real life, that smoking for 15 years is a bad idea, it’s too late to become healthy again – it causes irreparable harm to your health. You can improve this situation, but only up to a point, you can’t undo wrong decision totally. But if 15 years before you ran the simulation and saw that it’s better not to smoke at all – it would be great, wouldn’t it? Let us wish tons of success to our experts on their exciting and challenging road of changing and augmenting our reality. We can be quite sure that such ardent specialists won’t stop at what has already been achieved. NICE's solutions empower organizations to capture, analyze, and apply, in real time, insights from both structured and unstructured Big Data. In 2008, NICE began expanding offshore from their home office, and chose to partner with Delphi Software. Minimize development cost – NICE systems required Delphi to minimize overall development cost, and meet all required deadlines without compromising overall project code quality. 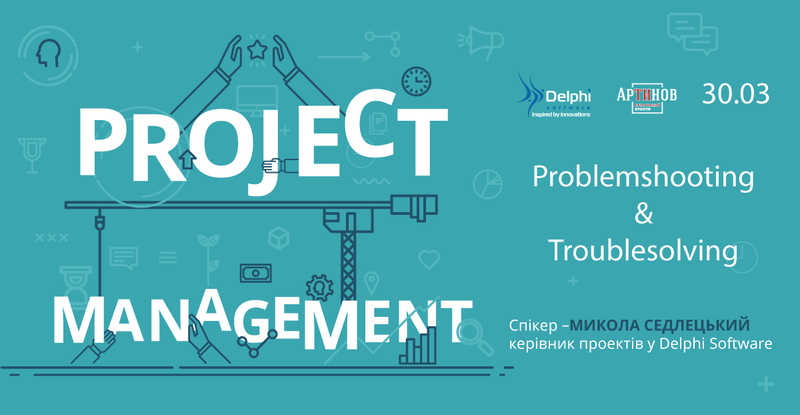 Understand complex project requirements and multiple product versions – Delphi worked with NICE to gain a comprehensive understanding of complex project requirements, and multiple branching versions of their products. Constant software changes the minimal documentation – the NICE software constantly changed – and Delphi had to adapt to these changes, often without adequate documentation. Support for diverse tools and technologies – throughout the project, Delphi had to work with NICE across multiple big data environments, and use dozens of different tools to ensure project success. Manage multiple live product installations – Delphi was responsible for installation and upgrade physically disparate and geographically-distant live product instances. Despite the numerous challenges involved in this project, Delphi exceeded client expectations. During the recent years of Delphi and NICE Systems partnership, Delphi developed more than six major releases of the product, organized and built the very stable team of 100+ engineers across R&D, Testing, and DevOps. @Please contact us, if you need more information. DELL, the world-leading end-to-end computing solutions company, as a line of business, allows its clients keeping, managing and protecting data with the scalable, end-to-end Dell storage technology stack. The Delphi team has participated in creation of one among them – FluidFS - a fully distributed, clustered file storage solution that supports both high-capable and performance-intensive workloads. Packlink is one of the most successful startups in Europe that work in area of delivery services aggregation. The company provides the consolidated access to the most known delivery services such as FedEx, DHL etc. as well as other smaller European companies. The solution allows users picking up themselves a carrier for their parcel among several available delivery providers. Sales Department Organization of one of the largest auto manufacturers, distributed worldwide, must have up-to-date marketing and sales materials. A sales representative, who works with other dealers as well as direct customers, should be able to demonstrate the recent 3D car models, advertisements, supporting software and other relevant data. The updated content should be deployed automatically from the main office and verified after the delivery in order to fully automate the process and make it reliable. FPGA, μC, CPU - ARM, PowerPC etc. Marvell - the leading provider of innovative semiconductor solutions - manufactures is the company that develops and markets digital semiconductor devices for converged network systems where voice, video, and data are handled using IP techniques. In 2011 Marvell partnered with the Delphi team in order to minimize development costs and, simultaneously, to grow up the R&D group in Eastern Europe that would be able to deal with both new and existing Marvell products. Build & maintain local hardware test laboratory with continuous upgrades of testing and measuring equipment - power monitors, oscilloscopes, logic analyzers, digital bus analyzers etc. DSP Group is the leading global provider of wireless chipset solutions for converged communications that produces wireless chipset solutions for DECT, ULE, Wi-Fi, PSTN, video and VoIP. From 2006, the Delphi team helped DSP Group with firmware design, development and customization for DECT (Digital Enhanced Cordless Technology) phones and SIP (IP Telephony) phones. Provide the chipset customization for well-known brands – like Philips, General Electric, Motorola etc. Siklu delivers multi-gigabit fiber-like wireless broadband connectivity in urban, suburban and rural areas. Operating in the millimeter wave (mmWave) bands, its wireless solutions are being used by leading service providers, safe city and smart city projects worldwide. Siklu offers street level and rooftop solutions, including small cell backhaul, LTE/LTE-A backhaul, WiFi backhaul, business broadband connectivity, wireless security networks, smart city networks, enterprise and campus connectivity, and residential broadband connectivity for various markets. Design and develop a new WiGig communication device product alongside with simultaneously support of legacy P2P V-band, E-Band product lines. The world pioneer in the speech recognition and understanding domain, Nuance designs and delivers technologies that intuitively link man and machine allowing usage of natural language to communicate with a computer. Dragon NaturallySpeaking, the world's best-selling speech recognition software, allows users turning their speech and talk to computers into text and commands. For today, Dragon supports the unbelievable 99% recognition accuracy. Dragon is offered in the multiple editions to meet the specific needs of particular industries or individual users. The world pioneer in the speech recognition and understanding domain Nuance designs and delivers technologies that intuitively link man and machine and allow using natural language to communicate with a computer. In 2013, Nuance intended to design the most innovative and modern voice assistant to compete with Siri and Cortana. In addition to working with the operation systems features such as the device control and management, the product should aggregate for the world most known web services. Support the integration with 25+ various web services like social networks, media providers, news providers, mails, calendars, etc. Large companies have extensive policy databases that determine how business operations are to be carried out within the organization. For example, accounting policies define how certain expense calculations should be carried out, travel policies set forth rules for business trips – and so on. These large companies have absolutely enormous documents repositories, and it can be hard to find the correct documents quickly, and keep them up to date. To this end, Delphi Software was brought in by a major corporation to design and implement a system that would allow critical policy documents to be found quickly and easily and, moreover, by voice. The solution to this particular client project was twofold. First, Delphi created a voice-enable natural language processing (NLP) system that could interpret the contents of each piece of documentation. Each policy document could be converted and fed into a natural language processing program. This allowed employees to interact with the system in the very natural way. Instead of browsing through thousands of files, an employee searching for a document about PTO policy could simply say “Show me PTO policy files”. The Delphi solution has a module architecture, and it makes possible switching between various 3rd party components in order to compare their accuracy. Second, Delphi used the same policy documentation to create a comprehensive keyword search engine that would bring up the most relevant results for each piece of documentation. The initial search accuracy is more than 80% and could be significantly increased by the consequent training by real users. These two systems can be used stand-alone or together, in order to maximize operational efficiency, and ensure that all employees are able to access the policy documents required to perform their duties – thereby solving the client’s issue. Any of the trading companies is always willing to maintain success and be flexible in the changing customer, social, technological realities and demands and E-Commerce appears to be real problem solving. Delphi Software was requested to assist in maintaining a huge number of orders in the online shop. Chatbots and Artificial Intelligence can really bring solutions to this business challenges. Chatbots are text-based programs powered by AI and natural learning processes that interact with users over a variety of platforms. 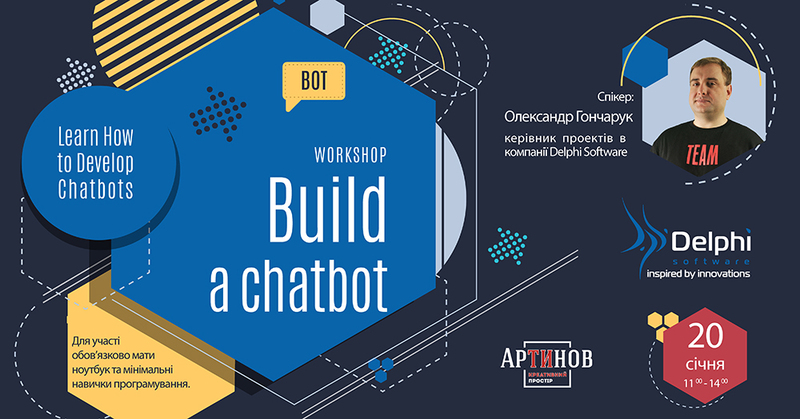 Chatbots for E-Commerce help the customer to promote and sell the products through mobile messengers. Using them, business is great to increase sales, improve targeting, improve customer service, increase productivity, and cut down on operational costs. Blue Cross Blue Shield Association is the federation of 36 separate United States health insurance organizations and companies that provides health insurance to more than 106 million Americans — more than any other insurance company does. The company requires a modern and scalable web representation for their internal and external needs and asked Delphi to help with the upgrade of some parts of their existing web system. NetProspex is the leading marketing data company focused on helping B2B marketers to improve their program results, reduce costs associated with bad data, and realize greater business value from their contact data. In 2009, Delphi started building a totally new web solution to increase the output efficiency from the contact data pool, in particular, by the corresponding big data analytics and reporting. In 2015, NetProspex was acquired by Dun & Bradstreet (DnB) company aiming to provide B2B marketers with the mature data marketing solution that cleansed and enrich professional contact data. Global-e is a leading provider of comprehensive cross-border solutions that enables retailers to sell globally to customers in more than 200 destinations worldwide offering a localized, seamless international customer experience. The company provides a unique technology-based, end-to-end solution for online merchants to handle all their cross-border sales. NICE Systems empowers organizations to capture, analyze, and apply, in real time, insights from both structured and unstructured Big Data. Due to the overall system complexity, it is vitally important to monitor the status of installed NICE products for a particular client and to raise prompt alerts with the different severity in case of issues. Aditor, the trusted advisor of the top global brands in online entertainment, sports and gaming, specializes in mobile advertisement and precise marketing targets management. The most effective way to detect and prevent network compromises and data breaches lays through the early recognition and investigation of potentially suspicious network activity. Delphi specialists participated in development of Active Data Profiling that recognizes suspicious deviations in data flows and runs the corresponding alerts. Detect non-standard data chunks in real-time data flow – like non-standard activity of a particular user group, an unexpected response to a system update etc. EMC is the global leader in enabling businesses and service providers to transform their operations and deliver information technology as a service (ITaaS). Cloud computing offers undeniable benefits of deployment flexibility & agility, scaling and cost-effective resource utilization. However, the strengths and benefits of cloud computing must be balanced against the loss of control and visibility available in cloud deployments. SecureVM solution provides organizations with the security controls necessary to run virtualized machines in the cloud with confidence. Dragon Anywhere cloud solution allows creating and editing documents, as well as formatting and sharing them by voice. All of this could be done directly from the user’s mobile device - iOS and Android - with the extremely high accuracy and without any word limit. Support various integrations with the 3rd-party solutions such as Evernote, MS OneNote etc. NICE Systems empowers organizations to capture, analyze, and apply, in real time, insights from both structured and unstructured Big Data that comes from multiple sources. NICE supports various options for its solutions’ distributed deployment, configuration and applications set. In order to cover successfully all this variety during development, testing and staging processes, NICE uses virtualization that hosts dozens of thousands of various NICE environments. One of Delphi clients is the world’s largest Social Casino games industry leads that brings to the market various highly immersive social games including free-to-play casino-style games to social networks. The company wanted to update its portfolio significantly, by launching the new products and by acquiring competitor’s solutions. Uncle Buck company, located in the UK, provides online short-term cash loans for the local community. The company developed and has been continuously improving the corresponded analytical model in order to determine the corresponded level of trust for each applicant. The algorithm is supported by the in-house developed web-based solution that integrates with more than ten various 3rd-party components. The Delphi team was invited to assess the existing solution and to provide the ideas according to its upgrade. This Delphi’s client is the one of the world leaders in binary options platforms that providers their customers with a customizable, high-performance and feature-rich platform for Binary Options and Forex trading. In 2013, the company started the partnership with Delphi in order to strengthen its R&D team in the front-end, database, testing, and DevOps areas. Amis Digital is the full-service data-driven company that provides solutions in the data analysis and data management for various marketing purposes. The software developed collects users’ inputs via various media channels and then finds insights in this data plethora via the corresponding analytics. bwin is a part of GVC Group and the world number one company in online gaming that supports more than 30,000 bets each day and shapes the future of digital entertainment. Besides its own unique and premium software on mobile, tablet and desktop, for some games, bwin also provides the corresponded white-label services to its partners. Support the quick implementation of the white-label branding – various skins, minor game modifications etc. Playtika is the world’s largest Social Casino games company that was the first to introduce free-to-play casino-style games to social networks leveraging our social casino roots. For today, Palytika unites 1,300+ employees but in 2010, when it was started as a start-up, the Delphi engineers and designers helped to deliver the first slot game. 888 is one of the world’s most popular online gaming entertainment and solutions providers. 888 provides to players and B2B partners the innovative and market-leading online games, above all in safe and secure environment corresponding to all the regulations. Among company’s gaming portfolio there are its own casino, poker, bingo and sport bets games. At B2B segment 888 gives the possibility to use its mature gaming platform and to help its partners with white-label solutions. During the last 15 years, Delphi has gained the terrific expertise in the art and game design areas. Delphi specialists have contrived and accomplished more than 200 various games – strategy casual, multiplayer online, casinos, console, social etc. - from the scenario writing to post-production support. Some of the pieces of this great story could be found here. The solution has lots of customer specific demands based on customer's environment, security policies and high availability needs. System Testing process targets not only to validate how NICE solution work as a whole, but also how it integrates and operates with customer's OS, SQL, IE, 3rd party software, security limitations, and, on top of that, how NICE solution works in the disaster recovery configuration. The world pioneer in the speech recognition and understanding domain, Nuance designs and delivers technologies that intuitively link man and computer in order to use natural language for both dictation and commands. Dragon product family is the largest and the most reliable desktop vocabulary dictation solution. It’s 99% accurate in the voice recognition. To meet exact demands from the particular lines of business, Dragon offers the variety of solutions targeting to Healthcare, Legal, Medical and other market niches. Parasoft supports software organizations with the innovative tools they need to successfully develop and deploy applications in the embedded, enterprise, and IoT markets in order to deliver defect-free software products. Parasoft’s solutions automate the time-consuming testing tasks and provide the intelligent analytics by integrating static and runtime analysis; unit, functional, and API testing; and service virtualization. The static analysis is grounded on the broad support for different languages and standards like Security, C/C++, Java, .Net, FDA, Safety-Critical etc. One of Delphi Software partners plays the leading role in the real-time data analytics domain. The company has the huge enterprise client base worldwide that use the company solutions installed on-premises. The data gathered for analytics is very sensitive and must be stored with 100% reliability. However, despite of the solutions quality and the corresponding alarm-&-monitoring systems installed, there is a chance that some data could be lost due to hardware or client’s personnel issues. In addition, when the product must be upgraded to a new version or migrated to another hardware, the process must be executed on a “live” system without stopping process of data storing and analysis. Delphi Software was the main engineering partner Playtika started collaborating with in 2010. When the business grows to the production level, the necessity to monitor the company’s software farm has emerged – in order to guarantee the reliable and smooth support for the thousands of the concurrent users. A large client in the online gaming (casino, poker, and gambling) market came to Delphi, seeking DevOps and maintenance support for their aging IT infrastructure. In this case, the client challenge was relatively simple – implement comprehensive monitoring and DevOps systems to monitor legacy projects and infrastructure. However, this simple challenge turned out to be more difficult than initially expected. In order to effectively streamline the DevOps process for this client’s outdated software, a comprehensive, step-by-step strategy was developed. Acquire knowledge – Delphi began by examining the client’s systems, and using relevant reference data to gain a deep understanding of the architecture, implementation, and day-to-day use of mission-critical systems. Design DevOps processes – Delphi developed a comprehensive set of DevOps processes from the ground-up. Set up a new development environment – To maximize operational efficiency, Delphi created a specialized development environment for the client. Replace legacy Nagios monitoring system – Delphi worked to replace the outdated Nagios monitoring system with Amazon AWS CloudWatch, providing the modern DevOps tools required for streamlined operation. Introduce a centralized logs collector/processor – This centralized database provides near-real-time error analysis, allowing DevOps processes to be much more efficient and proactive. Take ownership of day-to-day support, incident responsibility – After implementation of the above steps, Delphi provided the client with a small team responsible for updating, maintaining, and owning their new DevOps system. By providing a comprehensive plan, proper support, and proactive DevOps solutions, Delphi Software was able to dramatically improve the uptime of the client’s legacy infrastructure, and provided the tools necessary to keep it running for years to come. Vinnytsia Delphi Software is currently looking for a Team Leader C# in our office in Vinnytsia. Join BitTech, our long-term partner from Israel, that creates advanced and innovative technological solutions for Forex market. Our company has been providing superior IT services for more than 25 years to the world-wide leaders in such segments as Enterprise Solutions, Big Data, Speech-&-Language, Mobile Development, Internet of Things, and Gaming. Among our partners are: Dell, NICE Systems, Motorola, etc. Today we have offices in Ukraine and the USA with headquarters in Redwood City, California. BitTech, our long-term partner from Israeli hi-tech domain, designs and delivers multi-technology software systems for financial services industry as advanced and innovative B2B Forex solutions. Vinnytsia Delphi Software is currently looking for a System Administrator in our office in Vinnytsia. Good knowledge of Web tools and protocols and Cloud ecosystem including CDN, DNS, AWS, Load Balancers, HTTP, NGinx, Varnish, etc. Vinnytsia Delphi Software is currently looking for a Back End C# .NET Developer in our office in Vinnytsia. Vinnytsia Delphi Software is currently looking for a BI Developer (QlikView) in our office in Vinnytsia. Vinnytsia Delphi Software is currently looking for a Senior Demandware Developer in our office in Vinnytsia. Join Global-e, Europe's leading provider of comprehensive cross-border solutions that enables retailers to sell globally. Global-e is Europe's leading provider of comprehensive cross-border solutions that enables retailers to sell globally to customers in more than 200 destinations worldwide offering a localized, seamless international customer experience. The solution supports 60+ currencies, 45+ different payment methods, localized multi-lingual checkout, multiple shipping options and local duty and tax calculation. Kyiv Delphi Software is currently looking for a Senior Demandware Developer in our office in Kyiv. Attention to details, a strong sense of ownership, pride in the quality of one's work and the ability to meet deadlines. Ability to learn new technologies quickly and adapt to a fast-paced development environment. 4+ years of proven experience as a full stack web developer. 3+ years of proven development experience in SFCC (Demandware). Proven development experience with relational databases such as MS SQL Server. Deep understanding of cross-browser issues, standards and responsive design. High-performance tuning and troubleshooting capabilities in a cross-technology environment. Intermediate/Upper-Intermediate level of written and verbal English, including client communication and project skills. Bachelor's Degree in Information Technology (Computer Science, Computer Engineering) or related field of study. Salesforce Commerce Cloud or Demandware Certification would be preferred. Work in a creative friendly environment using cutting-edge technologies. Work-life balance and flexible schedule. Competitive compensation with focus on your expectations; annual salary review and performance bonus paid twice a year. 24-day paid vacation and 100% paid sick leave. Financial and legal support for individual entrepreneurs from our side. Professional, language and soft skills trainings. Health insurance coverage: individual and family, Fitness plan. Vinnytsia Delphi Software is currently looking for a QAA Engineer in our office in Vinnytsia. Share knowledge with the team through training, documents, etc. Vinnytsia Delphi Software is currently looking for a Senior Full Stack C# .NET Developer in our office in Vinnytsia. Vinnytsia Delphi Software is currently looking for a C# Back End Developer in our office in Vinnytsia. Join ScribbleLive, the world's leading content cloud provider. Over 1000 global businesses including Red Bull, Dell, NBA, Bank of America, Yahoo and Bayer have decided to use ScribbleLive, the world's leading content cloud provider, to deliver superior results with their content. We're inviting you to join this mighty company! Vinnytsia Delphi Software is currently looking for a JS Front End Developer in our office in Vinnytsia. Experience with build tools, code coverage and testing frameworks - webpack, karma, etc. Vinnytsia Delphi Software is currently looking for a Java Developer in our office in Vinnytsia. Join NICE Systems the worldwide leading provider of software solutions in real time insights and analytics from both structured and unstructured Big Data. NICE Systems, our long-term partner from Israeli hi-tech domain, architect and deliver top-notch software solutions that empowers organizations to capture, analyze and apply insights from both structured and unstructured Big Data. Right now NICE is establishing a new group for a new product and we're proud to be a part of it! If you looking for technology challenges, prefer to follow Agile routines and ready to explore new professional horizons, this opportunity is for you. Vinnytsia Delphi Software is currently looking for a Senior Java Developer in our office in Vinnytsia. Vinnytsia Delphi Software is currently looking for a Back End C# Developer in our office in Vinnytsia. Vinnytsia Delphi Software is currently looking for a Middle DevOps Engineer in our office in Vinnytsia. Kyiv Delphi Software is currently looking for an Senior Linux C/C++ Developer in our office in Kyiv. Join Siklu Inc., a leading vendor specialising in Gigabit wireless backhaul solutions in the 60, 70 & 80 GHz millimeter wave bands. Our customer is Siklu Inc., the global market leader in millimeter wave wireless solutions, founded in 2008 by a team of wireless veterans experienced in consumer electronics, with the vision of using all-silicon technology advances from the consumer electronics industry to transform high capacity networks. They used cutting edge technology to reduce cost and increase reliability of carrier grade wireless connectivity. New features implementation for customer's devices. Developing SW for WiGig devices. Refactoring and optimization of the code. At least 3 years of solid, hands-on software development experience. Highly proficient with C/C++, proven knowledge of OO design and multi-threading. Practiced usage and deep understanding of networking layer-2 (Ethernet) and layer-3 (IP) protocols. Intermediate level of written and verbal English communication skills, including client communication and project skills. Bachelor's Degree in Information Technology (Computer Science, Information Systems, Electrical and Computer Engineering) or related field of study. Financial support and legal support for individual entrepreneurs from our side. Kyiv Delphi Software is currently looking for Senior Linux C/C++ Developers in our office in Kyiv. Join Vast Data, a NYC-based storage company. Vast Data, a NYC-based storage company, breaks decades-old data storage tradeoffs & brings an end to complex storage tiering and HDD usage in the enterprise. We are looking for smart, passionate and independent developers to join our team who are eager to learn and contribute. We're building a fast, cheap and highly scalable storage system (think peta-byte scale pied-piper). Strong experience in C/C++ software engineer design, coding, integration, and debugging. Understanding of Linux operating system. Experience with OO design concepts, multi-threading. Ability to quickly understand existing code and adjust to new environments. Intermediate/Upper-Intermediate level of written and verbal English communication skills. Great team skills, ability to work with customers and teammates. Experience with NAS solutions and file sharing protocols, SMB. Kyiv Delphi Software is currently looking for a Senior C/C++ Developer in our office in Kyiv. Join Dell EMC, a part of the Dell Technologies family of brands. Dell EMC is a part of the Dell Technologies family of brands. Dell Technologies is a unique family of businesses that provides the essential infrastructure for organizations to build their digital future, transform IT and protect their most important asset: information. We're looking for a person who has in-depth knowledge of systems software engineering in distributed systems, operating system internals and multi-threading environments; strong C/C++ experience; loves the challenges of very complicated, distributed systems; is innovative and has great personal skills. If you're ready to join an outstanding and passionate team of lead & senior engineers at our Kyiv Office, you've come to the right place. Just apply below and we'll get in touch to let you know what the next steps are. Must have been a senior member of a highly successful product development team where candidate made major architectural and programming contributions. 3+ years of commercial experience as a C/C++ Developer in Linux environment. Experience with NAS solutions and file sharing protocols. Kyiv Delphi Software is currently looking for a Senior QA Engineer in our office in Kyiv. Join CTERA, a venture-backed software company that enables enterprise organizations to deploy secure cloud file services and modernize legacy IT infrastructure. CTERA Networks, based in Israel and New York, NY, is a privately held company founded in 2008 and backed by Benchmark Capital, Bessemer Venture Partners, Venrock and Cisco. CTERA provides cloud storage solutions that enable service providers and enterprises to launch managed storage, backup, file sharing and mobile collaboration services using a single platform and based on the the cloud storage infrastructure of their choice. Join a team of dedicated, innovative-thinkers who are here to change the world and how enterprises secure and manage its data. You will ensure that CTERA software is awesome and high-quality, and will do so with a positive, collaborative attitude and approach to testing. You will build product test strategies, write and execute test plans, file bugs and communicate with the team about issues, risk, and product quality, and later help to educate others in Engineering and Product on the above. Increase test coverage by end-2-end and feature specific test cases, mainly focus on the NAS and Sync domains. Work as part of a Scrum team to triage inbound bug reports and reproduce reported issues. Work closely with development engineers & product managers to gather requirements. A commitment to collaborative problem solving, sophisticated thinking and quality agenda are essential. At least 3 years of industry experience in Software Quality Assurance, with a deep understanding of Quality processes and methodologies, and with a passion for the field of Quality Assurance. Expert in a Manual Testing across multiple platforms and testing techniques. Good understanding of a software development lifecycle and well-versed in the software testing discipline. Upper-Intermediate/Advanced level of written and verbal English communication skills. Good understanding of file sync and share concepts (Dropbox, OneDrive, etc.). Good understanding of cloud computing concepts. Team player, autodidact, have excellent communication skills. Bachelor's Degree in Information Technology (Computer Science, Information Systems, Electrical and Computer Engineering) or related field of study. It's not required, though preferred. Vinnytsia Delphi Software is currently looking for a talented Data Science/Machine Learning Engineer in our office in Vinnytsia. Join our Data Science team to gain an expertise in the area of such a high demand. Prototyping, testing, and implementing Data Science based features. Passion about Data Science and Math. Relevant experience with Data Science projects. Knowing of Linear Algebra, Probability and Statistics and Numerical methods. Understanding of Machine Learning techniques like Linear Regression, Decision Trees, SVM, kNN, Random Forest, etc. Experience with Python-based Data Science toolkits. Working experience with large, real world data - big, messy, incomplete, full of errors. Experience with mining of structured, semi-structured, and unstructured data. Entry level for TensorFlow or other deep learning framework like Theano or PyTorch. Experience with programming in Python or Scala for Apache Spark. Worked with AWS, Redshift, Jasper, Hadoop. RESTfull API creation in Python (Flask, Falcon or similar). Work in creative friendly environment using cutting-edge technologies. Kyiv Vervoe is currently looking for a DevOps Engineer on a full-time basis in Kyiv. Join Vervoe to work on an AI-powered skill-testing platform that uncovers hidden talent through real-world tests, tasks and tools. Vervoe, https://vervoe.com/, is an intelligent hiring platform that uncovers hidden talent through real-world tests, tasks and tools designed by leading industry experts. Position is responsible for the deployment and maintenance of a AWS cloud-based business solution. The successful candidate must have a B.Sc. in Computer Science (or equivalent), plus a minimum of 2 years' experience in developing, deploying and maintaining Amazon AWS based SaaS solutions is also required to be considered for this position. Responsible for deploying, automating, maintaining, troubleshooting and improving the systems that keep the infrastructure running smoothly. The role requires you to have hands-on technical experience and a can-do approach towards environment automation / management and continuous improvement. The role will encompass the use of a broad range of AWS technologies and application environments, with an emphasis on the implementation of best practice cloud security/redundancy and high availability principles. Developing architecture align with serverless services patterns (FaaS). AWS: 2+ years' experience with using a broad range of AWS technologies:CloudFront, Route 53, EC2, RDS, ELB, S3, VPC, IAM, Lambda, ElastiCache. Develop and maintain an Amazon AWS based cloud solution, with an emphasis on best practice cloud security. Scripting Skills: Python, Bash and automation skills. OO Programming Skills: Strong OO Programming skills (PHP, Python). ELK Stack: Elasticsearch, Logstash, Kibana. Competitive compensation with focus on your expectations. We are always on the lookout for talented professionals and unique personalities. If you think you are the perfect match for Delphi Software, please get in touch for our future job openings. @Please send us your CV or comments.